New indie release To Dust is equally strange, darkly funny, and insightful about the all-too-often mind-altering and devastating effects of grief. Filtered through a fable of sorts, it questions both the logistics of death and the inability to accept its reality and meaning by those left behind. 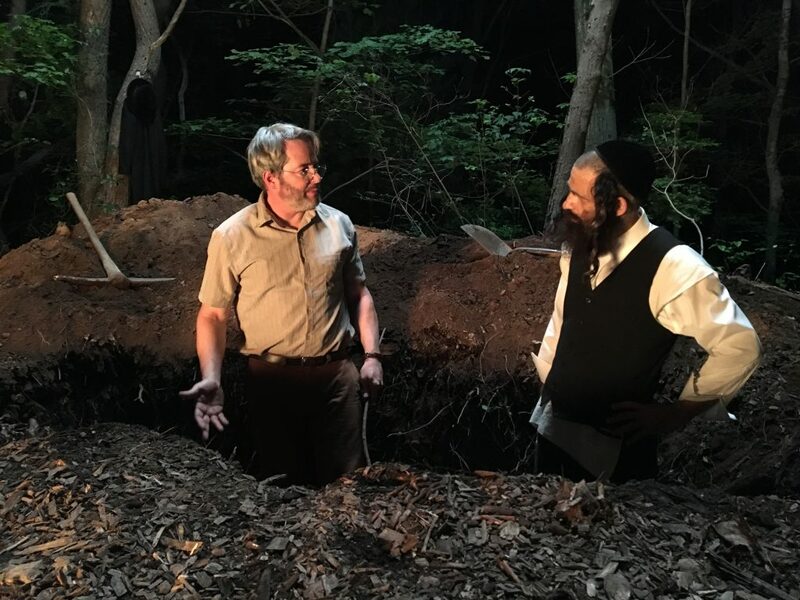 Director and co-writer Shawn Snyder, raised a reform Jew, studied religion at Harvard and found his way to this film after the loss of his mother reaffirmed his interest in the mysteries of faith, and the idiosyncratic ways people grieve. Hasidic cantor Shmuel (Son of Saul’s Geza Rohrig) suffers the immediate aftermath of the wife he loves dying of cancer by obsessing over the decay of her body. It begins to take over his every thought, and damage his relationship with his two pre-teen sons. He’s seeing visions of his wife’s decomposing corpse, and believes her soul will suffer until it turns back to dust. Out of desperation, he seeks help and explanation of the decaying process. He opens a line of inquiry about it with somewhat clueless college biology professor Albert (Matthew Broderick). Imperfect, ethically questionable, and messy forensic research ensues. In this odd couple, who egg each other on into creepy experiments, Rohrig’s Shmuel ever plays the straight man to Broderick’s Albert. Broderick earns laughs by just playing to his character, (and who can remember any film in which the actor hasn’t been 100% committed? ), who, bumbling, curses his way through what clearly must be feelings of incredulity at his circumstances. The reason he continues this ill-conceived partnership is a mixture of compassion, morbid curiosity, and boredom. The humor based in the storyline is decidedly dark, and certainly not for everyone. They murder a pig, (not onscreen, but still..), rob graves, and there are scenes with decomposing human bodies. Still, the entire film is centered on a man who yearns to get beyond his own crippling pain, even as he believes he sins in his attempts to do so, and the unlikely support he finds from the stranger helping him. From beat to beat it goes from morbidly funny to melancholy and back again, sometimes blurring the lines of the two, as is often the case with life living in mourning. What makes this so touching, if audiences can hang through the less palatable elements of storytelling, is that Albert does stick with Shmuel. He sees his suffering, and while he may be curious, his commitment to finding an answer is rooted in wanting to ease Shmuel’s pain. Anyone who has allowed themselves to feel the loss of someone, whether slowly through cancer, or some other more unexpected way, will certainly relate to being brought to the brink of insanity by the experience. There are very few movies that capture the kind of feverish distraction, the terror, that comes with loss. It shows up unbidden, and is nearly impossible to shake without the help of time. Shmuel tries to make sense of it, in his case through science, though his religion forbids that line of inquiry. That will resonate with many viewers who have at least, in some way, been there themselves. To Dust is not only good film, but one allies of women in film can support, as a number of the crew and department heads are women, including the composer Ariel Marx, Editor Allyson C. Johnson, costume designer Evren Catlin, production designer Alexandra Kaucher, and art director Cheyenne Ford. The last part of the film becomes much more subdued and poignant, although what Shmuel and Albert get up to is just as nuts. While in To Dust the characters find what they believe is a sort of answer, the things that will stay with audiences, anyone who has mourned a loved one will find deeply relatable. Grief is idiosyncratic, with no shortcuts through the experience. Death is both inevitable to all and will always be both bizarre and torture for those left behind. Faith is not fact-based. To know that people, even strangers, are willing to comfort the suffering through their loss, is one of the most beautiful truths about being human.